An outstanding Andalucian finca of more than 11,000,000 sq m comprising the main 200 year old Cortijo/ hunting lodge of 1500 sq m and 12 other farm buildings dotted around this huge estate that could each be converted into an independent property supporting its own agricultural activity. There are 10 bedrooms in the main Cortijo with the possibility of another 20 bedrooms in the other properties and the whole property has some 25 km of tracks which is surrounded by 40 km of fencing including olive plantations, pasture land, oak and ask trees. Cattle, goats and pigs. 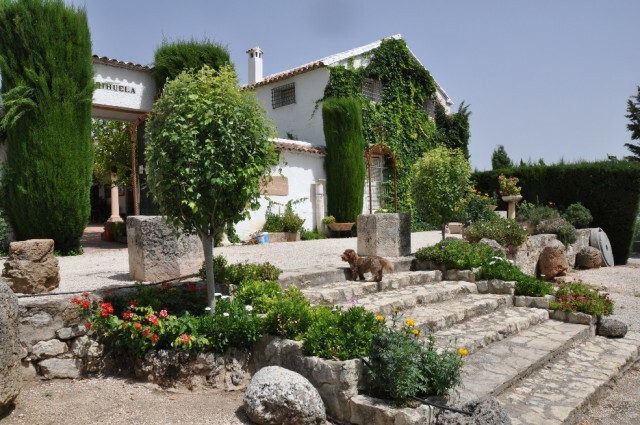 Entrance into the main Cortijo is down a 500 m track off the main road between Olvera and Algodonales with extensive shaded parking, up the stairway and through an imposing entance to a typical Andalucian patio with buildings/accomodation on 3 sides. To the left is the former farm laborers communal salon/dining area with an enormous fireplace and stairs leading up to the guest wing of 4 double bedrooms and 2 bathrooms. Also on the griound floor is a separate 3 bedroom aparment where the housekeeper lives. To the right is the main family living accomodation with salon, dining area kitchen and 3 bedrooms on the ground floor and a large meeting room/loft on the first floor. Plus 3 more bedrooms and a bathroom.. Ahead is the museum comprisng several large rooms housing antique horse carriages and farm implements. The main cortijo is surrounded by 800,000 sq m of olive trees and also 160,000 sq m of pistachios. This enormous finca offers amazing opportunities for a hotel or residential development or a farming commune. Set in the Heart of Andalucia, it´s probably the most interesting property I´ve viewed in the last 40 years - amazing potential - just as likely to see hang gliders soaring overhead as vultures and eagles.